I’ve been to the Bronx, and if you asked me to imagine a sandwich named after it I wouldn’t come up with corned beef, swiss cheese and sauerkraut topped with thousand island dressing on rye. First of all, this sandwich already has a name; it’s basically a reuben. And second of all, nothing about this sandwich suggests the Bronx. It’s in the wrong language, for one. It’s not even on point in the historical sense, the reuben was either invented in Midtown or Nebraska, nobody knows for certain. I digress. A misnamed sandwich can still be a delicious one, after all. The high point here was the marble rye, a dark, flavorful loaf grilled to a perfect crisp. The rest of the sandwich didn’t quite measure up, unfortunately. 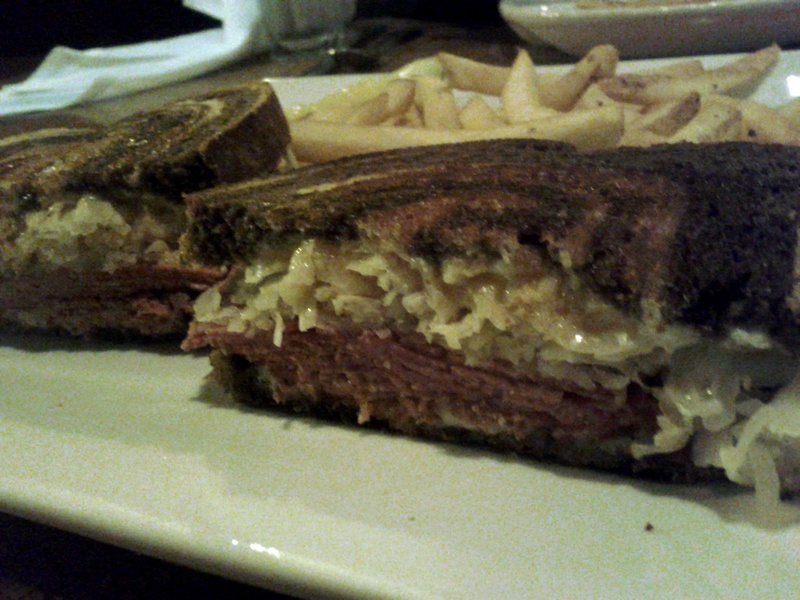 The sauerkraut was tasty enough, but the corned beef was far too salty. I know that when it comes to cured meat one has to expect a certain level of salt, but it’s all too easy to exceed that amount. Perhaps a bit more dressing might have leveled things off a bit, the sandwich was noticeably stingy with the dressing. But hypothetical solutions have never saved a sandwich-in-hand, and in the end the only thing I gained from this sandwich was a parched tongue. This entry was posted in Sandwich Reviews and tagged Reviews by Pete, San Jose, Sandwiches I Have Eaten by Pete. Bookmark the permalink.